Are you ready for a front garden makeover before the summer season begins? Now is the ideal time to reorganize that space before summer kicks in. Do the hard work in advance so you can relax with your guests outside when the sun comes out to play. Taking the time to maximize what outside space you have is a very worthwhile investment. It’s not only a wonderful spot to relax in, a great yard can boost the value of your home, too. Whether you want a formal or cottage-cute small garden, a native or clean and contemporary look, imagination is your only limitation. Keep things simple and minimalist or really let things go for a natural effect. How about if you’re stuck for ideas, though? With so many options it can be easy to get stuck and do nothing. Are You A Cottage Style Person? Your garden doesn’t have to have high maintenance in order to make a statement. Beauty can come from a neatly trimmed lawn, a subtle hedge or a splash of cottage-style color. Try some climbing roses to frame a front verandah or over a gated archway too. To achieve the ultimate cottage style, make sure to invest in lush, fragrant plants and flowers. Don’t stop with aesthetics, though. With this type of garden, think about incorporating some edible plants as well. That way, your garden won’t just look the part, you’ll have some glorious organic produce free of charge. Remember, cottage gardens evolved for highly practical reasons so stay true to their roots. With a cottage-style garden, the main emphasis is on a relaxed look. Informality rules here so mix and match to your heart’s content. Blend colors and textures and remember to properly maintain your garden. It’s a common mistake to believe these gardens take care of themselves. That said, you don’t need to strive for perfection. For an economical and original approach to beautifying a small outside area, a cottage garden is the way forward. Cottage gardens actually look better on a smaller scale so there’s a silver lining for you if you don’t have the world’s biggest yard. While the stereotypical formal grade graces the grounds of a large stately home, you can adopt formal principles on a smaller scale. The formal style requires frequent, meticulous cutting to maintain that pristine effect. Don’t take on this variety of garden unless you’re happy with breaking out the string trimmer. Structure and geometry should underpin a formal garden of any size. A small sculpture or ornament makes a superb centerpiece. Gravel and paving stones mean that maintenance here is kept to the bare minimum. On the planting side of things, lawns and hedges are the main features. Throw in some small trees if space permits. One of the leading benefits here is the classic elegance of the formal garden. If you are ready to embrace this strategy, make sure you invest in a solid set of garden tools with everything you need for clipping, cutting and storing taken care of. Also, it goes without saying that you should invest in a lawn mower, a pressure washer and a blower for the best looking patio year-round. Have you got high walls enclosing a small lawn? If so, the effect can become overpowering. Luckily, there’s a simple solution to this. All you need to do is reduce the perception of height with some visual trickery. The best way to do that is by investing in some compact patio furniture. Make this the focal point of your garden. Eyes will drawn to this furniture rather than focusing on the dimensions of the lawn. This patio furniture model delivers everything you need in fine style. You’ll get a sofa and 2 seats as well as a table for your food and drinks. With rugged galvanized steel frames and soft, understated cushions coordinating beautifully, you can’t go wrong. Kill two birds with one stone by getting somewhere ideal for relaxing with a BBQ and a glass of wine which also helps your garden to look bigger. Summer nights spent in your small garden make it all worthwhile. Why not invest in some outdoor lights that are soothing and relaxing to the eye? The last thing you want is blaring neon or, at the other extreme, a garden too dim and dingy. A great set like this model which features globe string lights with clear bulbs serves a turn for indoor and outdoor use. It will also work in a commercial setting. Lighting done well can create the right ambiance whether you are sitting in the garden of your house or on the rooftop of a skyscraper with limited space. You should also consider adding some shades or umbrellas in your patio or garden to make the space usable whatever the weather. The great news is that there are tons of shades and umbrellas to choose from. 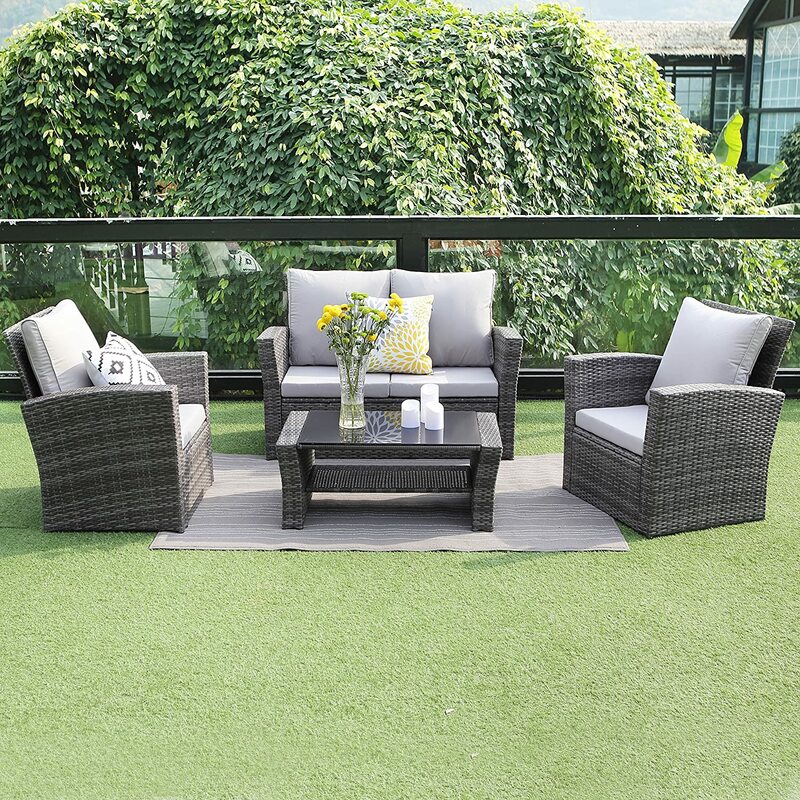 Here, you need to think carefully about which products match your patio decor and which can fit comfortably in your smaller garden. If you get the best umbrella, you can relax whether the sun is beating down or a few drops of rain are falling. Why limit yourself to ideal conditions only? This is a fantastic way to get the very most mileage from your outside space. We hope these 5 tips have given you some food for thought. Think about the style of your garden and the products you choose to go in it carefully. With a smaller garden, make every inch count! Enjoy your garden to the every fullest this year even if it is a little on the small side.